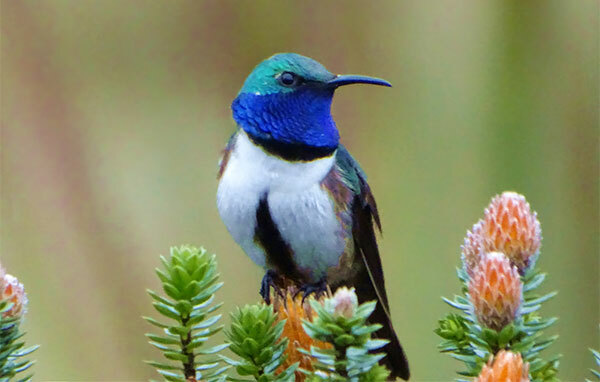 The newly-discovered Blue-throated Hillstar, a hummingbird species found on remote mountaintops in southern Ecuador, is in critical danger of extinction after mining corporations were given the rights to mine its home range. Now the World Land Trust (WLT) has launched an urgent appeal to raise £30,000 and save the bird’s habitat from destruction by metal mining using large open pits. The WLT wants to enable its partner – Naturaleza y Cultura Ecuador (NCE) – to extend a Water Protection Area to include the Blue-throated Hillstar’s 70,000 acre range. This would give it government-level protection and eliminate the threat of mining. “This is a unique opportunity to save a critically endangered species from extinction,” said Richard Cuthbert, Director of Conservation at WLT. “If we do not act now, mining corporations can move in on the habitat and create a mine which would most likely wipe out the bird’s population. The land is owned by local communities, who rely on the clean freshwater collected in the mountain ecosystem. With funds from the appeal, NCE will extend the proposed Water Protection Area so the total area protected will be almost 200,000 acres, providing water for at least 470,000 Ecuadorian people. As well as the Blue-throated Hillstar, the unique paramo habitat is home to a species of frog, the Tik Tik Rain Frog, discovered only last August, plus Spectacled Bear, Mountain Tapir and Andean Condor. It’s thought that other species may also be discovered there. You can find more information and donate online to save the Blue-throated Hillstar at worldlandtrust.org/hillstar or call the WLT office at 01986 874422.